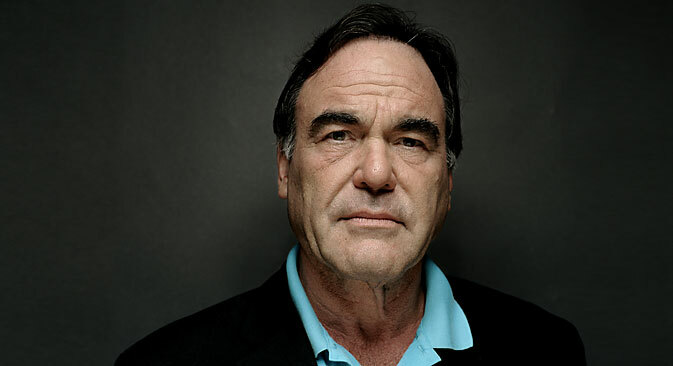 The latest documentary from the director Oliver Stone, Untold History of the United States, will soon be shown on Russia’s Channel One. In this candid interview, the maverick US film-maker talks about the significance of the work for a Russian audience and delivers his characteristically controversial views on some of the most pressing political issues of the day, including East-West relations and the Ukraine crisis. A book of the film will also be published. Peter Kuznik and I have just finished a 12-hour long documentary series, Untold History of the United States. The book came out of the film, not the other way around, which is more usual. I have been accused so many times by my critics of distorting the truth, that we decided to substantiate what we’re saying in the film with the book. We’ve sold Untold History in many countries. I am happy that after much effort, we managed to release the book and the television series in Russia. Russians have a completely different point of view on the First and the Second World Wars. Americans don’t understand a lot of the history of these wars, and we deal with that in the book. We wrote the book and did the TV series for young people, my daughter and sons, so that they can learn this history. I care very much about teaching history to younger people. The book addresses such controversial issues as the First and the Second World War, the Cold War and U.S.-USSR relations. The crisis in Ukraine is at the end of this long history. I am very interested in the history of these relations between the two countries, and it is a very large and complex issue. If you go back to the Second World War, there were very bloody fights in Ukraine. A lot of Russians died there fighting the Nazis, as well as those Ukrainian troops who allied with the Germans. But Americans don’t know that and don’t understand that Russia saved the world from Hitler. In my opinion, the Soviet army’s destruction of most of the German military machine saved at least a million American lives. In that war, 300,000-plus Americans were killed. Imagine if we’d had to enter the war earlier; if, for example, the Soviet Union after defeating the Germans at Stalingrad and Kursk had refused to go further alone and left the Allies to fight the rest of the war. This was the fear for Churchill and Roosevelt. The United States could have lost a million more soldiers. I liked him, although I know that he was unpopular and was removed from power in 1991. I think that if Mikhail Gorbachev had been allowed to continue, the world would be in a better position now. But the United States wanted to make Russia a capitalist country, sending its experts, the so-called Harvard boys, who advised and freed up the economy. And the result was a gangster economy. I think, though many feel differently, that Vladimir Putin has played a very important role to stop the slide in Russia. He said no to Yeltsin’s policies, and put in the new state order and the new authoritarianism. I think it gave Russians a sense of certainty and consistency; gave them back their pride. In the Nineties, Russia’s economy shrank to the size of the economy of the Netherlands. Taking back the state from the hands of the gangsters was a very important move for Russia. On that basis, I certainly admire Putin as a strong man. We are finishing the screenplay of my film now. We hope to start shooting early next year and have it released by the end of 2015. This is my work as a dramatist: to make you understand Snowden. And I’m working on it. I’m not taking a point of view, saying that Snowden is good or bad. Here is the story and I let the people make their own conclusions. I went to see Mr. Gorbachev a few months ago. He disapproves of what the United States has done, calling it a betrayal of Russia and the spirit of agreements made with George Bush Snr. They were nothing on paper, but there was a spirit. That spirit was violated first by Bill Clinton and again by George W Bush and Barack Obama. Since then, 13 states have joined Nato. For Russia this is a nightmare. NATO was finished after the end of the Cold War; there were no reasons for the western alliance to continue. It was a defensive alliance to protect Western Europe; it has since become an offensive alliance that incorporated Eastern Europe and is putting a missile shield near the border with Russia. The situation in Ukraine was the last test. It started with an attempt to put NATO into Georgia. Then there was a hidden desire to put Ukraine into the alliance and block access to Sevastopol for Russia, where it has a fleet. Doing so would be the equivalent of emasculation, and Russia could not accept it. I understand why Putin could not give up Crimea. Western institutions – the European Union, NATO, the IMF – would like to have influence, run and control Ukraine. I do not think that’s great for Russia – that defends the rights of people in the south-east of Ukraine. I understand what the conflict is, but I think many Americans don’t understand the Russian point of view at all. They think that Russia wants to aggrandise itself, that Putin wants to revive the past. In my opinion, Putin has a defensive position, protecting the core geopolitical interests of the Russian state. And Putin has a right to do so, just as the leader of any other country has. It is the United States that is invasive and pushing constantly at the limits of Russian patience; as it was with Nato’s eastward expansion. It’s a very dangerous situation. It would be a catastrophe to push Russia past “the point”. The United States will not give up on Ukraine; but for Russia it is a frontier. It’s a shame. We are hurting Russia; hurting ourselves. Russia will find new partners in the East and Eurasia. They just signed new trade agreement with China. Russia will go on with or without sanctions. It’s a shame, but that’s the US style of doing things: they squeeze through the economy; through the media. You need patience to fight the dragon. I think Putin knows this, he is a very smart man; he already has experience like this. After 9/11, Putin was the first guy to call Bush. Russia had its own problems with the Chechen terrorists, and knew the power of Islamist terrorism. Therefore, in my opinion, Russia is a natural ally of the United States. Oh, it’s a shame. . . Extract from an interview first published in Russian by Rossiyskaya Gazeta.